Rick & I visited this emotional memorial and remarkable museum one morning this week. 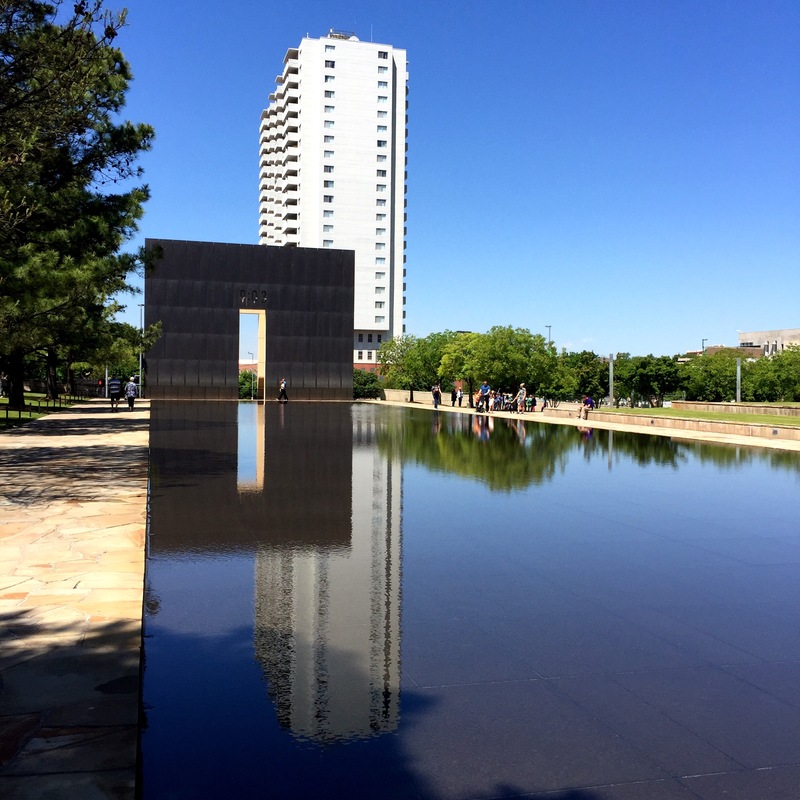 It was a beautiful day – not unlike that day in April 1995 when a massive bombing claimed 168 lives and changed America forever. 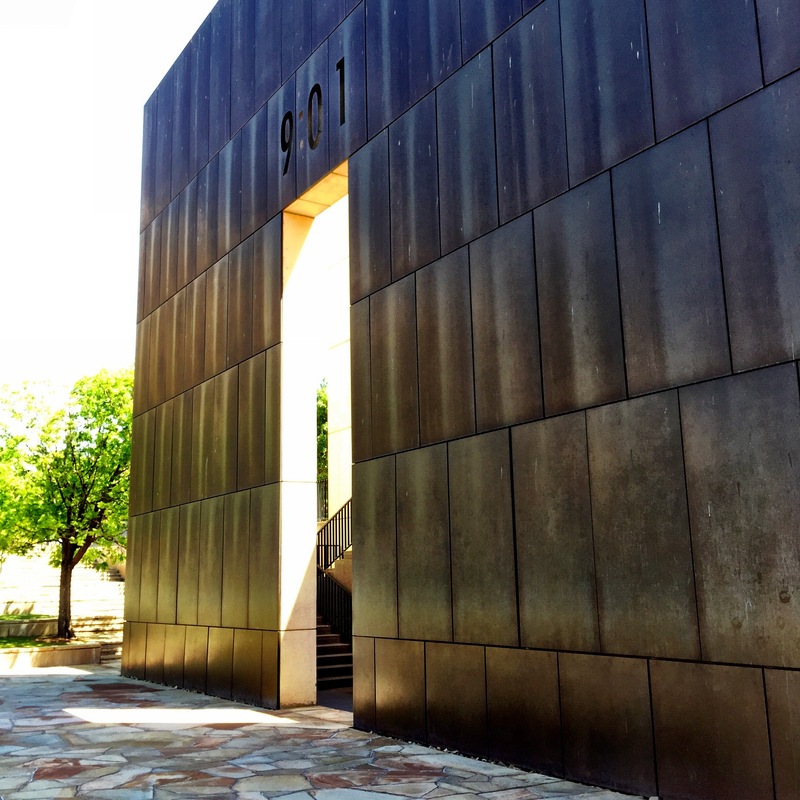 It’s an important reminder of the horror of domestic terrorism as well as the strength and resilience of our people – this sobering and stunning memorial should not be missed. 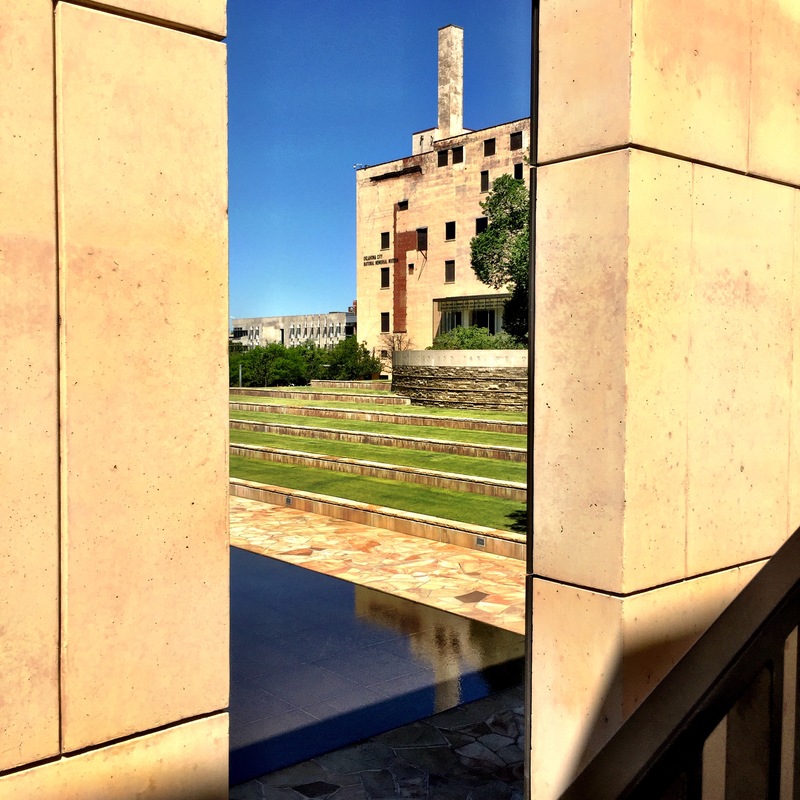 Looking through the first arch – named 9:01 – representing the time before bomb to the arch named 9:03 – time after the bomb – when the healing began. 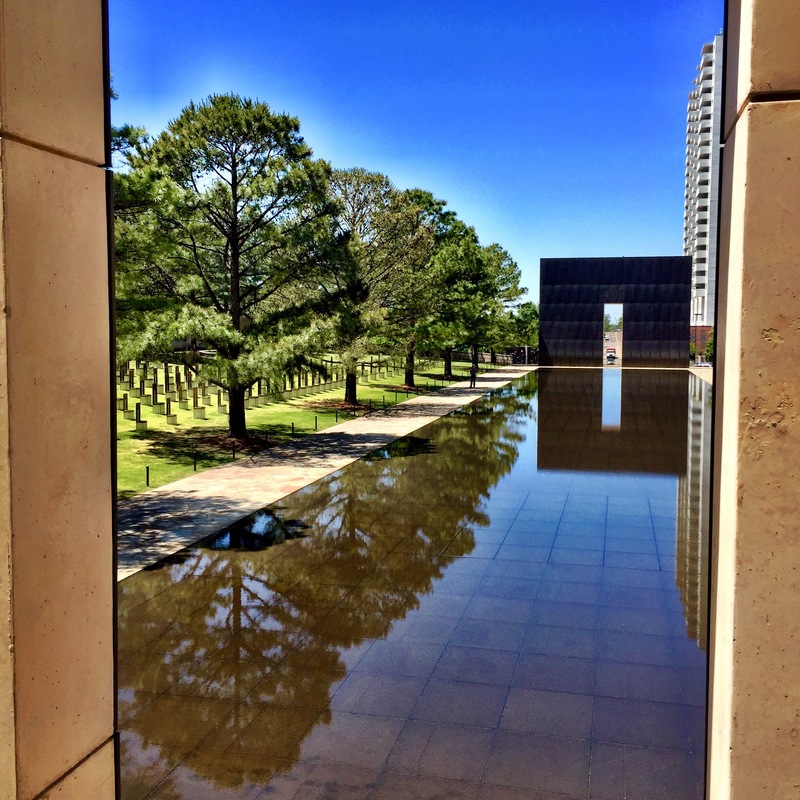 A shallow reflecting pool separates the two archs and may offer solace in a such a painful and sad place. The National Parks maintain the memorial and Park Rangers give quided tours to explain the memorial to the visitors who come to pay their respects. See 9:01 at top of this arch. 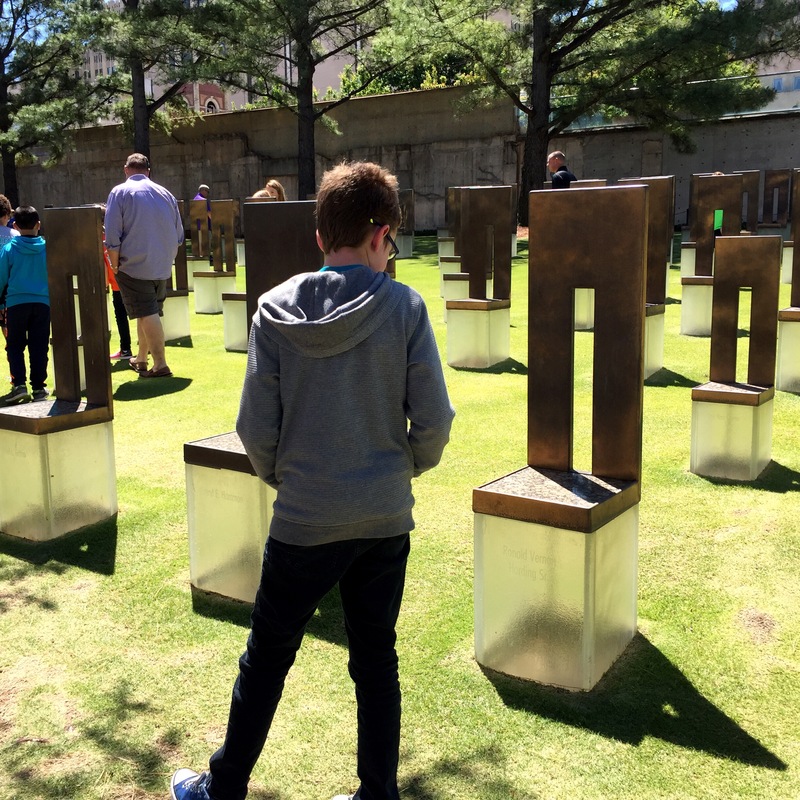 This young boy was reading each name on the chairs that represent the victims – smaller one in the background is for a child who died in the child care center. Earlier I eavesdropped as his Dad had explained the memorial to him. It was a touching sight I could not miss. 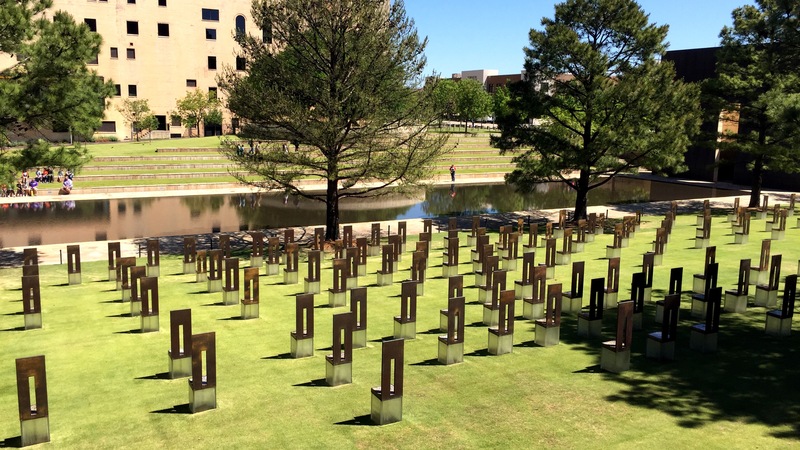 The chairs are placed in 9 rows – one for each floor where victims worked or were found. Victims were found in a Social Security Administration office on first floor as well as outside on sidewalks. Each chair has a victim’s name and is illuminated at night to show never ending reverence. The Museum – on the right seen thru the 9:01 arch – is in a building damaged by the bombing but rebuilt as a museum with scars left intact. This photo was taken from the plaza above the building footprint – it was not damaged and became the triage area immediately after the attack. 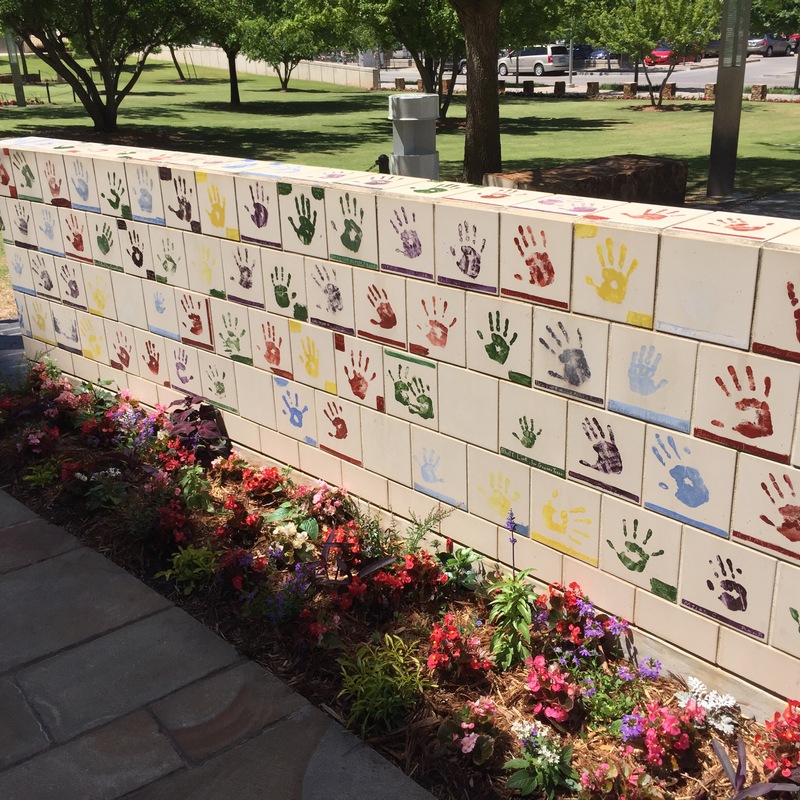 Wall of tiles made by children around America and sent as condolences to Oklahoma City in the aftermath. Each has their hand print and their City & State at the bottom of the tile. This is a sculpture of the controversial photograph showing the firefighter coming out trying to save a dying child. Although difficult to view – it serves as an important reminder of the lost innocents as well as our lost innocence that day. 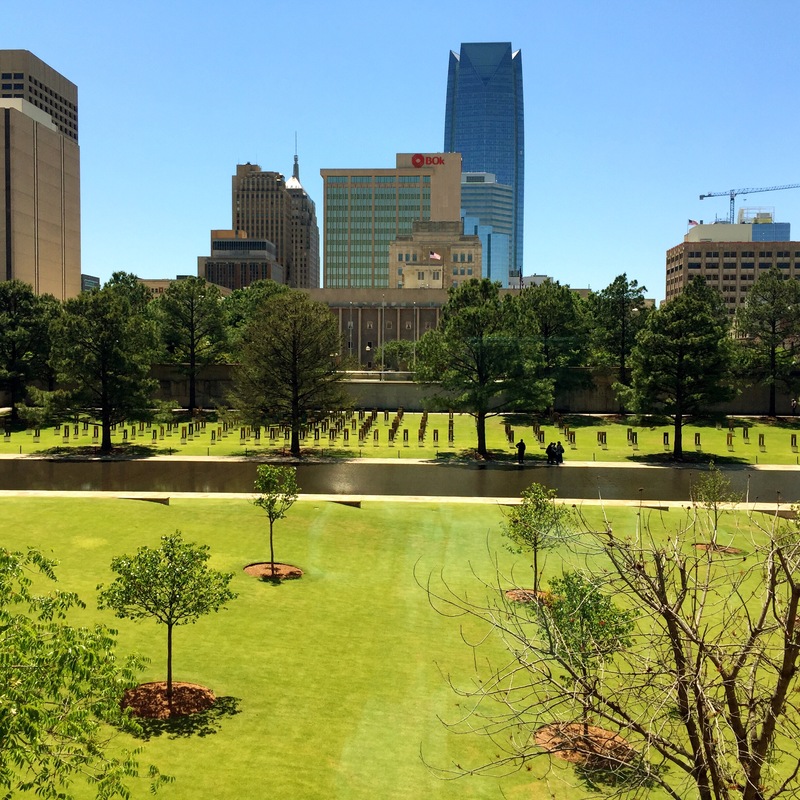 I included this view shot from the Museum to show Oklahoma City’s resilience and continuing efforts to rebuild itself after such a terrible tragedy. 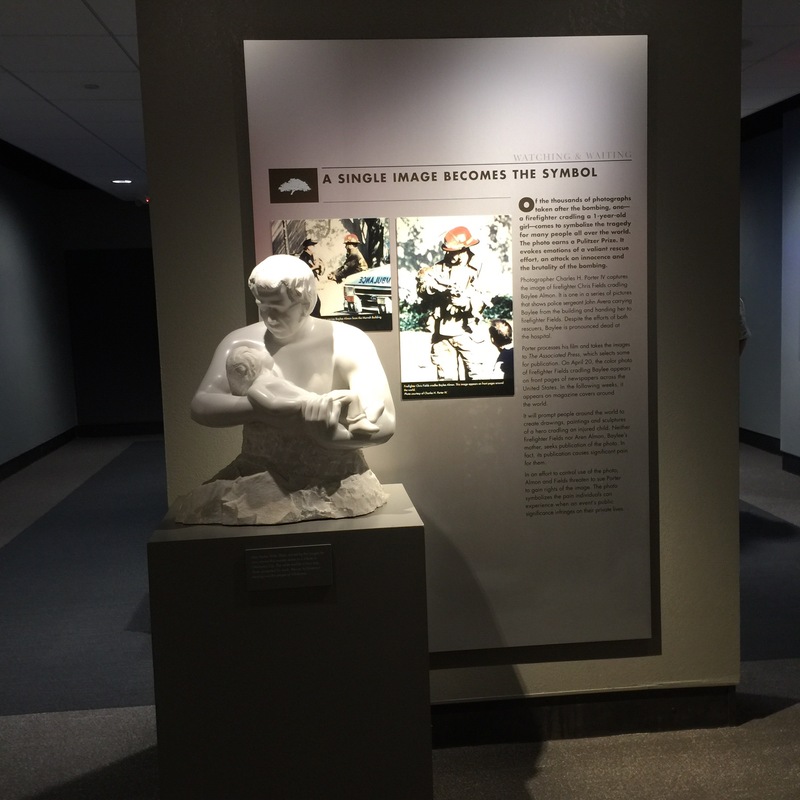 The Museum dramatically takes you back to the day, reminding you of how suddenly life changed for all of us. But most of all it tells the stories of rescue, life saving and recovery. It is a respectful and reverent tribute. 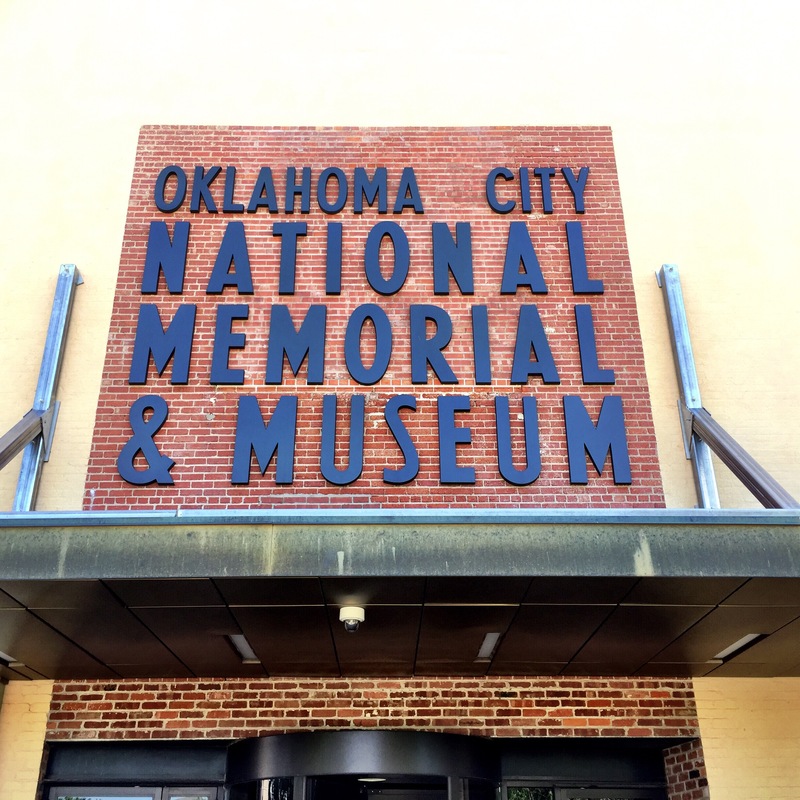 Previous PostPrevious OOOklahoma – where the wind comes sweeping down the plain….